I know there has been some talk around these parts that I’m nothing but a big tease. No more! I flip the sweaters: pink on top, white on the bottom! Pattern: a collaborative effort. I made the sweater look like the embroidered raglan sweater (do click on that link: the baby in the photo could be wearing a potato sack and I’d still knit it!) from Knitting for Two . I saw a completed pair of these sweaters on a blog recently. They were green, I think, and super cute, but for the life of me, I cannot remember which blog! 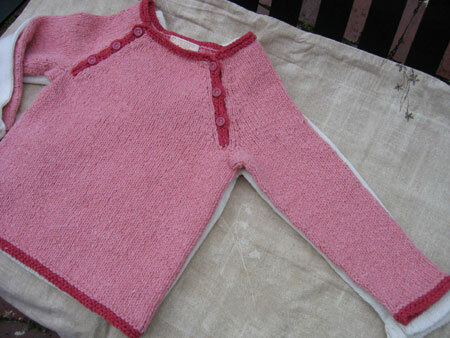 I used a Baby Gap sweater as the sizing template, and I knit it from the top-down, seamlessly, just like the Pico. ETA: It was Karma‘s blog! Yes, they are super cute now that I see them again ;). Yarn: Classic Silk by Classic Elite, 3 skeins of primrose, and just a bit of tomato. This yarn has un-freakin’-believable yardage. Needles and gauge: US 6 Blunti Stumpos, which actually worked well for this project, at a tension of 20.3 sts and 32 rows per 4″ square. Finished size: 22″ across the chest, and 9.25″ from hem to armpit. For all the measurements (at least those important for top-down raglans) click here. Details: I loved working with this yarn, but more importantly I loved its tweediness and terrycloth-like softness after machine-washing and drying (yes, I blatantly disregarded the care instructions on the label, it seems to wash just fine). I made one-row buttonholes from Montse Stanley (p. 196-7, my source for most knitting techniques), and affixed a customized ribbon label (tutorial here, close-up here). I’m happy to report that Little Miss Bestitched and her Mom liked the sweater, and even happier to tell you that the sweater was just a bit roomy – good, will be perfect for the fall ;). So adorable! And that fabric looks so soft and comfy. Wish I could pick it up and rub it against my cheek! Kathy, if I doubted your inventiveness before, your iron-on label/ribbon trick would have convinced me. Wish I’d thought of it but I’m glad you’ve done it, tested it, and made it easy to follow. I am so going to get that yarn now. Super cute. I love the colors and those buttons totally make the sweater. I saw the pics of Little Miss wearing the sweater and it turned out just wonderfully. Totally great. I’m ganking that sweater idea and making a full-sized-human one for me! That looks great! What a thoughtful gift. Btw… that kimono sweater is on sale at anthropologie.com…. just in case you have to have it after all. LOVE CLassic Silk as well. I work in a yarn shop and it’s by far the yarn I recommend the most! That sweater is too cute for babies…hmmmmm! Oh, that is adorable! Buttons on the raglans are such a good idea. Love the color too. Thanks for the tutorial! I will use that one soon! The sweater came out great! I own Knitting For Two and they do have such great projects. LOVE the label tutorial! You’re just way too crafty 🙂 I love it!!!! And the sweater is totally adorable. LOVE IT! Great to know about the yarn, I think I will get some for my gift to my new niece, due to arrive on september 26! adorable. how did you do the button openings on the top dow raglan? steeking? Okay, I get there’s no seams, but Pico. doesn’t have button openings… so how’d you do it? Separate balls? Back and forth? I saw a rack of ladies’ sweaters recently that had a diagonal buttonband like that. Cute, but made me think of baby sweaters! Cute baby, cute sweater. Great job! 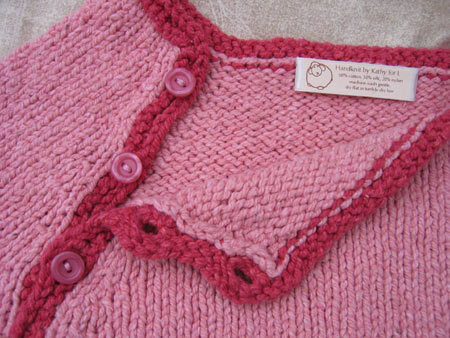 And that neck/collar makes dressing a squirmy little kidlet very much easier! Well done, you! I knit a couple of those Knitting for Two raglans earlier this year in green and turquoise Cotton Ease… LL is much more lux in her Classic Silk. Even though the pattern pretty wisely has buttons along the raglan to fit baby’s head through, I think you were genius to put buttons along both raglan seams. Some of those kids have enormous heads! 🙂 So pretty. That is a seriously beautiful baby sweater! Love love it! Very cute. I’m glad we finally got to see it! Beautiful sweater, I.need.that.yarn, saw it on the back of IK and liked it now that I know it washes up like terry cloth/butter, it.will.be.mine…. Just wanted to thank you for your custom label instructions. I made some and they are so cute. Thanks for thinking of a creative alternative!